The advent of inexpensive brushless motors, controllers and high energy density LiPo batteries has opened the flood gates in system design for electric free flight competition. 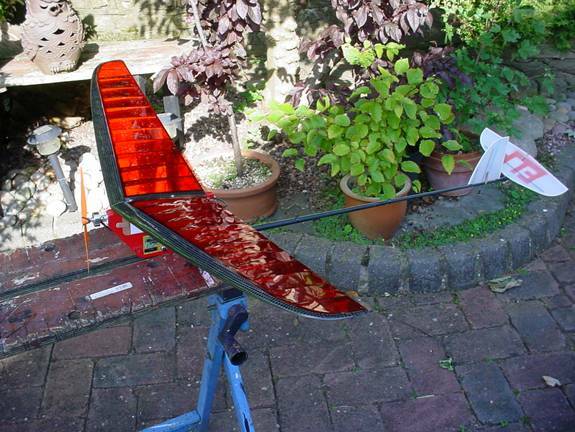 This is an attempt to produce a 'Proof of Concept' lightweight electric model for light air, using inexpensive components and avoiding the knock on effect of massively high power motors. The HTL (High Thrust Line) layout is a favourite of mine, the 4th in the series and easier to trim, in my opinion, than a conventional pylon layout. The thrust line is higher than the CoG giving a nose down pitching moment for incremental power increases. Hence the looping tendency of the HTL layout tends to be less sensitive than the pylon layout. 1. 40" span 155 mm root chord using ELF DLG wing , horizontal and vertical stabilisers. 2. Wing uses carbon D-box, carbon cap stripped ribs and modest undercamber. 3. 15gm Robotbirds budget outrunner, kv = 1300 revmin/volt with 10amp ESC, 240mah 2 cell Hyperion G3 25C battery with a GWS 7 x 3.5 propeller. 4. Flying weight is 145gms for a static thrust of 210gms (via speed/thrust correlation). 6. Specific energy density is 260Watt/kg. 7. A Ztron controller from bsdmicro was chosen having proved its durability and functionality in an electric Senator. This offers power modulation, motor run time and DT operation by a servo situated at the back of the pylon. This provides tail tilt DT driven by a Kevlar thread, reacted by a cantilevered spring on a slightly modified ELF tail mount. 8. The ESC, battery and wiring loom are accessed from the ply cover and an external 2mm banana plug at the rear of the pylon is used to arm the system. 9. Climb out is controlled by modest right thrust, no down thrust and right wing wash in. The model climbs right and glides right via the appropriate tail tilt. 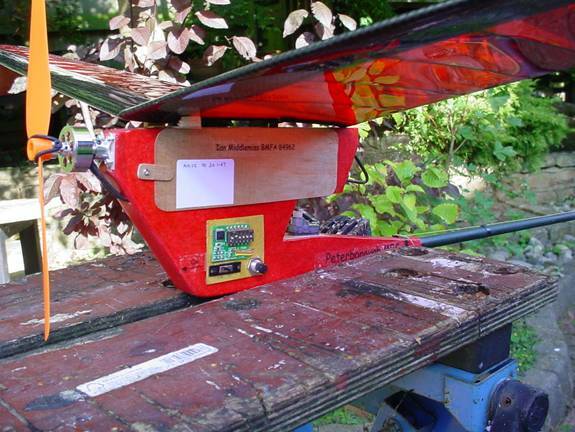 Trimming methodology is to start with low power for a 20s run and gradually increase, noting the change in flight pattern and taking the appropriate action to avoid disaster. This is contrary to SLOP and F1C practice and makes for a lengthy trimming period but so far I have not totalled an airframe and would never risk an untrimmed model at full chat even for 5s. I am happy with this method, however unconventional and would recommend it for the novice.